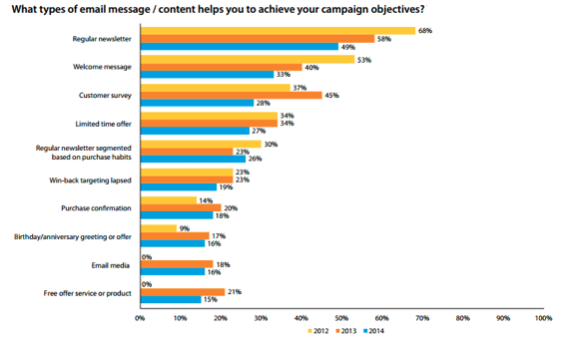 Marketers use a wide variety of approaches to reach prospects and customers via email. According to the 2015 National client email report by the DMA, newsletters, welcome messages, and customer surveys remain the top three ways for email marketers to achieve their campaign objectives. Let’s zoom in on the third most popular type of email: the customer survey. The 2014 drop in popularity of surveys could potentially mark a shift from surveys towards using behavioral data—such as click behavior and page visits—to build customer profiles or even for use by email recommendation engines. But at the same time I also expect that surveys are simply underused and not recognized for their immense versatility. Many marketers aren’t taking full advantage of the “power of the ask”. Although it is still number 3 on the list of most powerful email types the DMA. A survey email can be an excellent way to strengthen customer relationships and increase loyalty to a brand by expressing appreciation and even making customers feel special. This Nasty Gal email builds on brand to subscriber relationship, acknowledging the recipient as one of their best customers that they want to get to know better. The customer gets to feel special, while the brand gets customer input. And customers are probably more likely to participate because of that feeling of being special and included, so much so that Nasty Gal doesn’t offer an incentive for participating: Exclusivity and appreciation is how you treat your VIPs, and that can be incentive enough. Marketers are concerned with the overall satisfaction rate with their brand, the website and the customer service. Survey emails can help to gather information about customers’ experiences and perceptions, so brands can keep on improving. It’s also a feel good for the consumer to be asked for an opinion, making it a huge win- win. 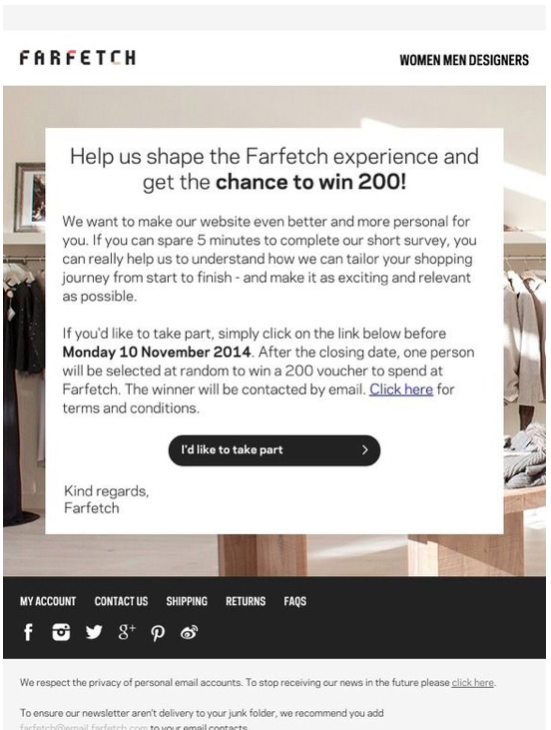 The brand gets genuine customer input in order to improve their service, products or marketing, and the consumer gets a chance to be heard…and sometimes a chance to win too, as in this survey email from Farfetch. In this mail, the brand asks customers to take a survey as Farfetch gathers information before improving their website. Customers who participate in the survey get a chance to win a voucher to spend with the brand. A survey email is also an effective way to get immediate feedback, asking for information while the experience is still fresh in the customer’s mind and therefore accurate. This Naked Pizza email follows up after a meal offering customers a chance to comment on the pizza right away. The leading text is perhaps a little too subjective for what is supposed to be a survey email (“deliciously”? “excellent”? “feel great”? ), but the customer’s input can be immediate. This Orbitz email is also a good follow-up survey email, although in this case it’s less quality assurance for the brand (Orbitz) and more giving input on a place the customer visited on a trip, in order to provide feedback for other travelers. In this mobile receipt, Swamp Rabbit Café and Grocery takes the immediacy of customer feedback to a whole new level, by simply asking for input on the experience with a smiley face and a frowny face right there on the receipt. 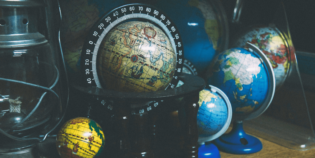 Gathering more data for targeted and segmented email marketing later on, is probably the most common reason for using customer surveys. That’s because the more one knows about one’s customers, the more targeted email marketing can be. Although they are more likely to share their preferences and profile information, still customers generally do not like to hand over masses and masses of data at the beginning stages of the relationship with a brand. This email from Zazzle asks for quite a bit of information. It is framed in a “help us to help you” kind of way, by promising the data that will in turn lead to better, more targeted emails. You see some open fields in the questionnaire, these are great for getting more detailed feedback / answers that you didn’t think of before. Review your questions before sending out any survey! 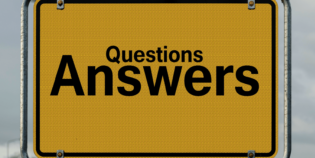 A marketer should always review the questions they are about to ask. What you as a marketer do with the information once we have it? But also: what is the best way to gather that information? Questions like “What is your favorite time to open our emails?” or “Do you open our emails on a phone?” like Zazzle asked, what will they be able to do with that information? First off, that type of behavioral data can be gathered by looking at the open statistics. (assuming they have email marketing software that is able to do what they need). But then? Send a mobile optimized version to them at the time the individual is most likely to open? With all the mobile email opens nowadays, you should be sending out a mobile optimized version to everybody anyway. This might the biggest takeaway of the article: before you send out the survey, review the questions + possible answers for usability later on. Brands can also make their subscribers part of their creative teams by using survey emails to ask for ideas and input. 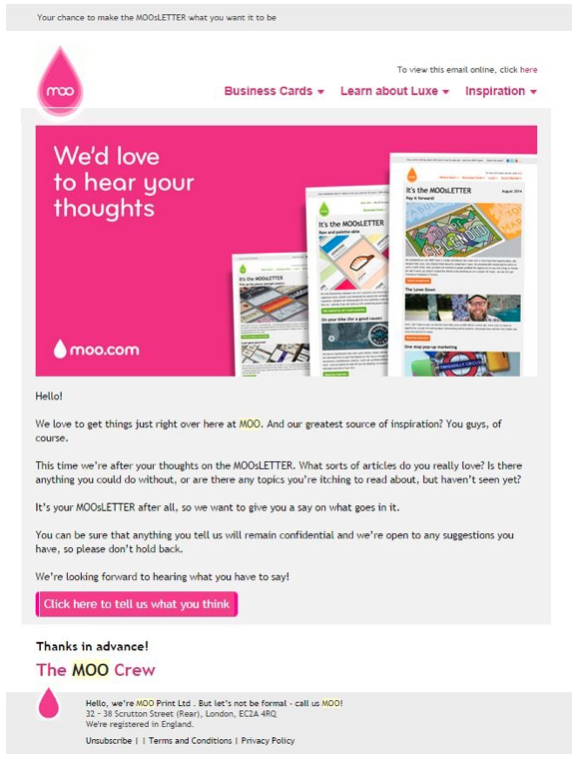 For example, MOO uses a survey email to seek suggestions for the MOOsletter, asking subscribers for the kinds of content they want to receive. This is an excellent way to achieve three different goals: 1) staying top of mind in the subscriber’s inbox, 2) making the subscriber feel valued by asking for input, and 3) generating article ideas that subscribers are truly interested in without spending hours, days or even weeks generating article ideas on their own. The constant opportunity to be marketing is one commonality to note among all of these different ways to do survey emails. Regardless of the intent of the email on the surface, every survey email has the potential to keep a brand top of mind, deepen engagement at the inbox level (thereby improving deliverability), and make a sale. A survey email can work as a way to generate additional sales too. This Taylor Stitch survey email is well done on two levels (in addition to being attractive in design). On the one hand, the idea of an annual survey tells customers this is not an ad hoc seeking out of opinions, but a regular part of how this brand does business. Which is a pretty good idea. There will always be changes in data and likes and dislikes. To update even the personal info and preferences, a periodical survey can be a great instrument. Not all data will be as up-to-date after a while! On the other hand – and this was what I was getting to, below the survey the recipient finds products to buy, shown by on-brand, stylish photos. It’s a chance to sell more in a survey email—while the mail is also genuinely asking for input too. Selling more can also happen by including an incentive for participating in the survey. BlueFly does that in their email, offering $20 off an order of $100 or more just for doing the survey. 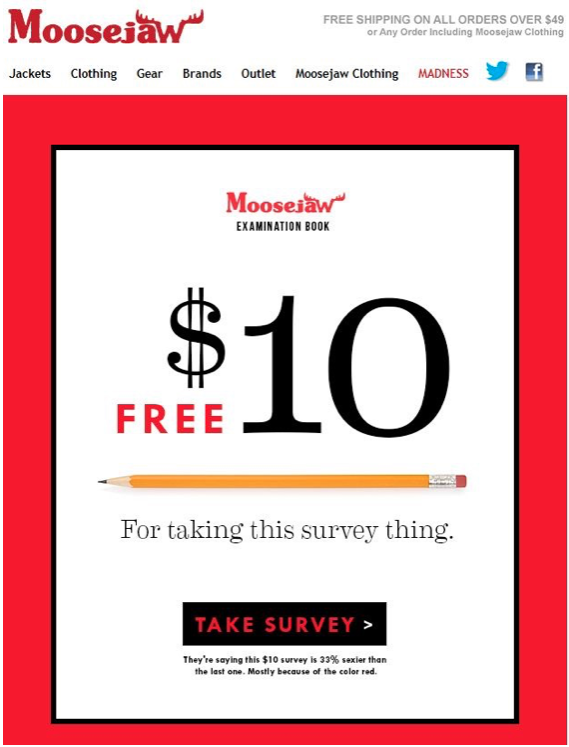 Then there’s this Moosejaw email that’s all about the incentive, with a huge “free $10” in the email, and tiny type about the survey. You can understand that this is might actually be nothing more than a smart sales tactic. Survey emails are undoubtedly underappreciated and underused by most marketers. 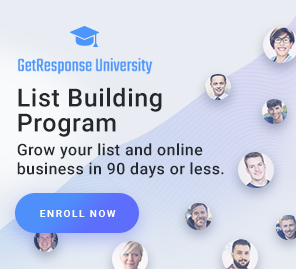 They are a powerful tactic that is easy for any marketer to employ (in fact, surveys can be sent as an automated email), and as you have seen it can help you achieve multiple goals. The DMA email client report puts survey emails on number 3 on the list of most powerful email types. So make sure you make the most out of the “power of the ask”. Are customer surveys already a part of your email marketing strategy? What was the last survey you sent out?